Roasting strawberries highlights their natural sweetness and extras are excellent as a topping for oatmeal the next morning. Wheat berries add a nice chewy texture to the salad, but feel free to mix and match with your favorite grains like quinoa or couscous. Preheat the oven to 200°F. Place 2 cups strawberries in a baking dish. Roast until soft and juicy, about 40 minutes. Meanwhile, toast almonds. Heat a small pan over medium heat. Place almonds in the pan and spread in a single layer. Toast until they start to turn golden and become aromatic, stirring occasionally, about 5 minutes, watching carefully so they don’t burn. Remove from heat and let cool while assembling salad. To make the dressing, combine remaining 1 cup fresh strawberries, vinegar and pepper in a blender. Cover and blend at top speed until berries are fully combined and smooth, about 1 minute, scraping down the sides of the blender with a rubber spatula. 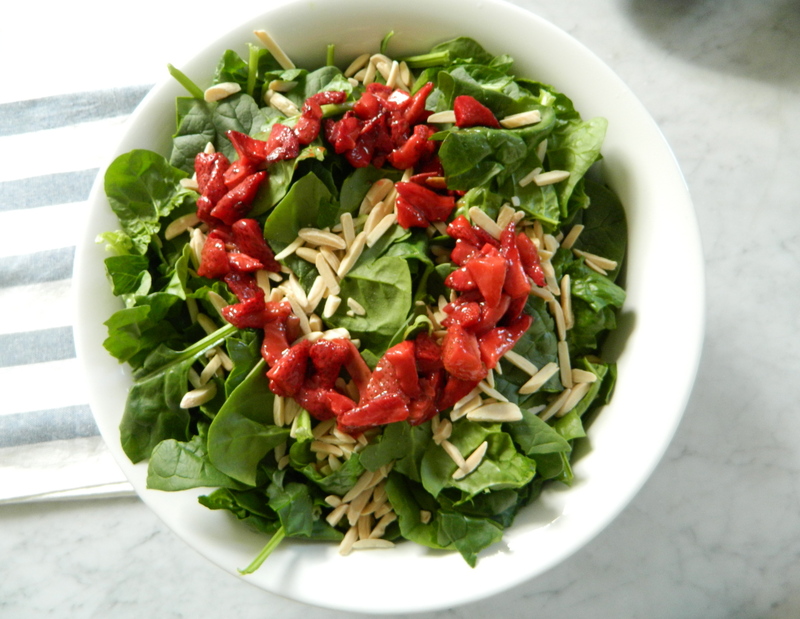 In a large bowl, add baby spinach, wheat berries and roasted strawberries. Pour any roasting juices from strawberries onto the salad. Add the dressing and toss to combine. Garnish with toasted almonds.